Denys PAVLENKO (BIOART PhD student) is main author for an article just released in Scientific Reports 6. Scientific Reports is an online, open access journal from the publishers of Nature. Co-authors are Esmée van Geffen, Mies J. van Steenbergen, Griet Glorieux, Raymond Vanholder, Karin G. F. Gerritsen & Dimitrios Stamatialis. Aniela SKRZYPCZYK (BIOART PhD student), along with 2 BIOART's supervisors, wrote a Lab Resource article. Prof. Dimitrios STAMATIALIS, BIOART's coordinator, is the Guest Editor of a Focus Issue of the International Journal of Artificial Organs. This Special Focus Issue is devoted to bioartificial organs and tissue engineering. It presents valuable observations on the current bioartificial organs and tissue engineering solutions to assist, mimic and /or replace damaged patients’ organs. 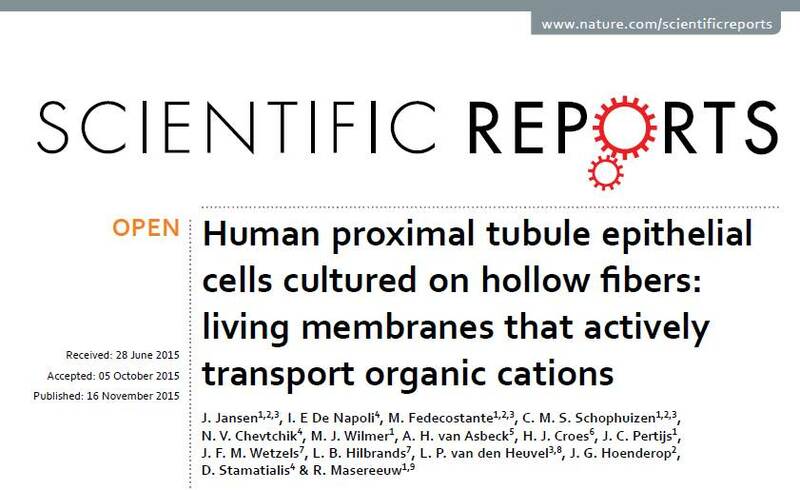 Michele FEDECOSTANTE, BIOART PhD Fellow, is 2nd author for an article published in Scientific Reports 6, in May 2016. The article is entitled "Bioengineered kidney tubules efficiently excrete uremic toxins". Co-authors are M.J. Wilmer, J.G. Peters, U.M. Kreuser, P.H. van den Broek, R.A. Mensink, T.J. Boltje, D. Stamatialis, J.F. Wetzels, L.P. van den Heuvel, J.G. Hoenderop, R. Masereeuw. Haysam AHMED, BIOART PhD Fellow, is 2nd author of the following article, published in Current Stem Cell Research and Therapy, along with several other researchers involved in BIOART: "Recent Strategies combining biomaterials and Stem Cells for Bone, Liver and Skin Regeneration." Seyed Danial NAGHIB (BIOART Phd Fellow) is main author for the following article, published in IFAC-PapersOnLine. BIOART supervisors are among the co-authors. The paper, entitled "Biotechnological challenges of bioartificial kidney engineering", offers a concise review on essential components in bioartificial kidney development: frequently used biomaterials, extracellular matrices, suitable renal cells and co-culture approaches.